A while back I made this Esme Tunic and it’s been in heavy circulation since. This is one of the most well-worn items in my handmade wardrobe. The pattern is from Lotta Jansdotter’s most recent book, Everyday Style (affiliate link), which is an inspiring, textile-filled book and probably one of my new favorites. The fabric was purchased last year at Superbuzzy, I got it while I was at Craftcation. They have a very impressive selection of heavy-duty Japanese fabric and this woven striped print was calling my name. I love the subtle lemon/lime green stripe. 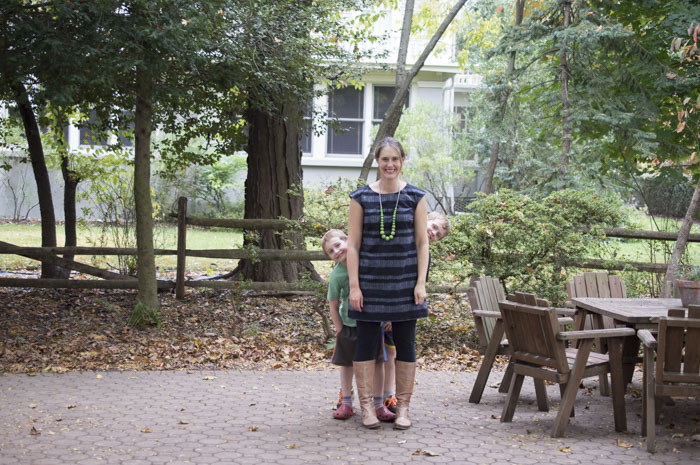 I made the Esme last spring, as a top, in Nani Iro fabric, and was immediately eager to try it as a tunic and I’m so glad I eventually got around to it. I put in french seams, which I do as a standard now. I just hate worry about fraying fabric when I wash my handmade clothes. At first I was a little nervous that the cap sleeves looked a little too ‘quarterback’ on me. I’ve got very broad shoulders as it is but I really have ended up liking how the sleeves poke out. It’s very architectural. 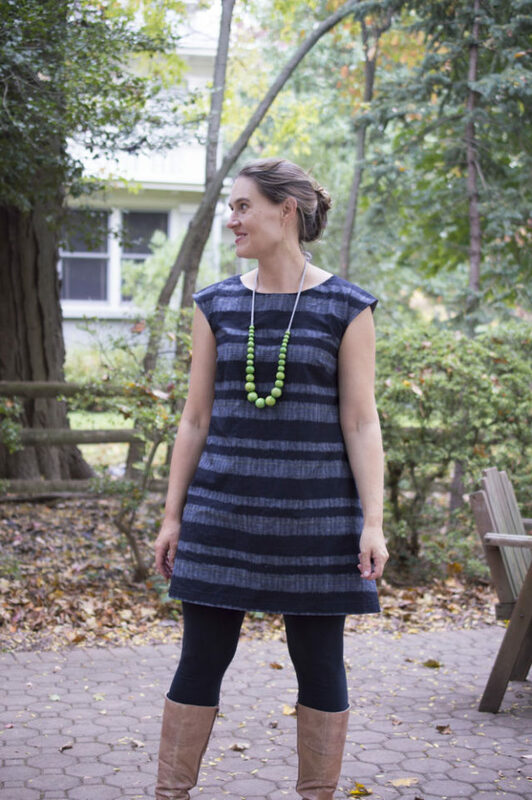 The shape and fit of this tunic are perfect for me. 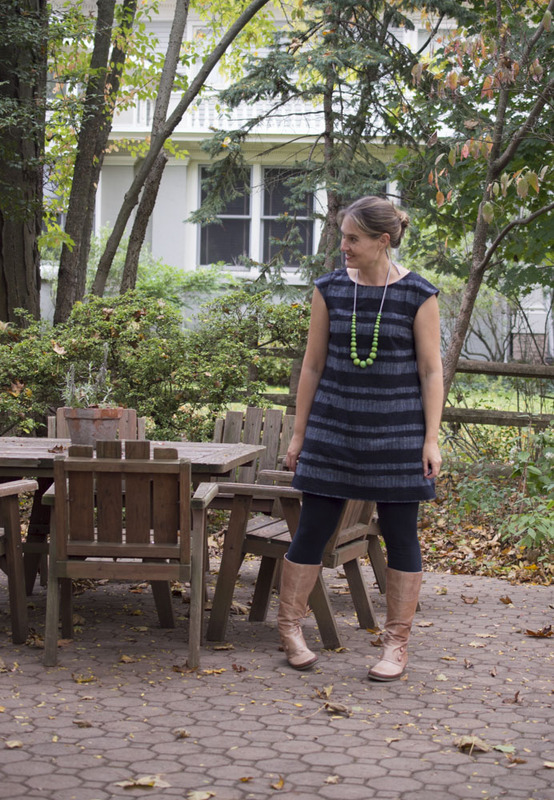 Throwing a tunic over leggings with boots is pretty much my dream outfit. We can all agree that good leggings feel like pajamas and a tunic leaves room for tummy expansion throughout the day but looks like a dress. I feel comfortable but look like I put some effort in. Score! So versatile. I might even get away with a little bit of winter weather wear if I toss on a cardigan or little jacket. I can wear this when I need to be a mom and want to break out of the t-shirt and jeans uniform. It also goes perfectly with my favorite set of Madre Beads, the Kelley. Which, I wear almost constantly anyway and coincidentally, looks to be the same color as Greenery, the official Pantone Color of the Year for 2017. I love lime green so I’m finally excited about the Pantone choice of color. As another random aside, I have a close friend who is a professor and she got so tired of stressing out about what to wear that she decided on a kind of uniform. Can you imagine worrying about what hundreds of undergrads will think about your outfit? Ugh. She wears the same thing all week and just removed the stress of deciding what to wear. 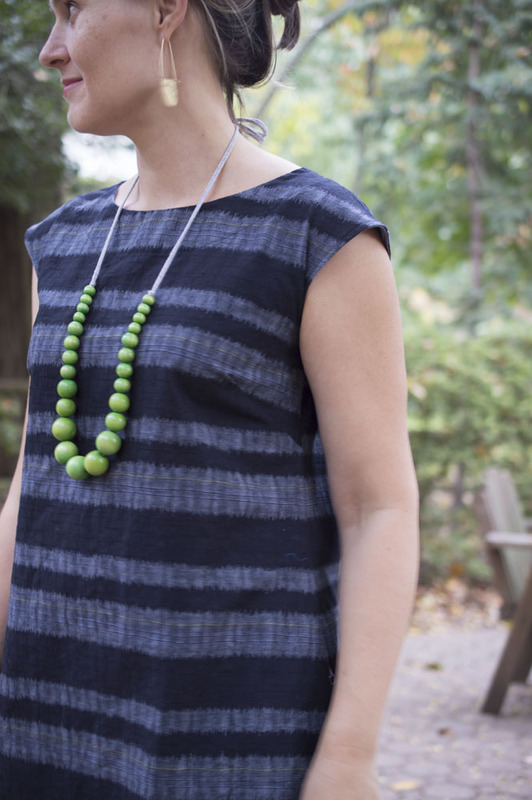 I can imagine making half a dozen of these tunics and making it my uniform! If I do make more Esme Tunics, I will definitely add sleeves. I can’t go sleeveless all the time! I am hoping that with structured fabric similar to this a sleeved tunic wouldn’t come out overly frumpy. That’s always my worry when I add sleeves. You look chic ! Love that style and Nani Iro. Gorgeous Madre beads too. I often freak out when deciding what to wear– maybe 2017 will be my year of tunics and dresses. Oh, and SuperBuzzy is always so fun to shop. Lovely tunic, I always wear this kind of thing, the cap sleeves look great and the fabric looks great. I could do with a couple of these in my wardrobe, I never know what to wear in the mornings and often pick the same few outfits. You are one of the smart ones with a uniform(esque) wardrobe. Genius! I say keep going with it! Hello Melissa, did you ever make the long sleeved version? I am not a sewist, so maybe this is a crazy idea, but I wondered if it would be possible to remove the sleeves from an old turtle neck or other long sleeved tee shirt and add them to the sleeveless top? It would look like layering. I am not going to do this but thought it would be an idea for you.